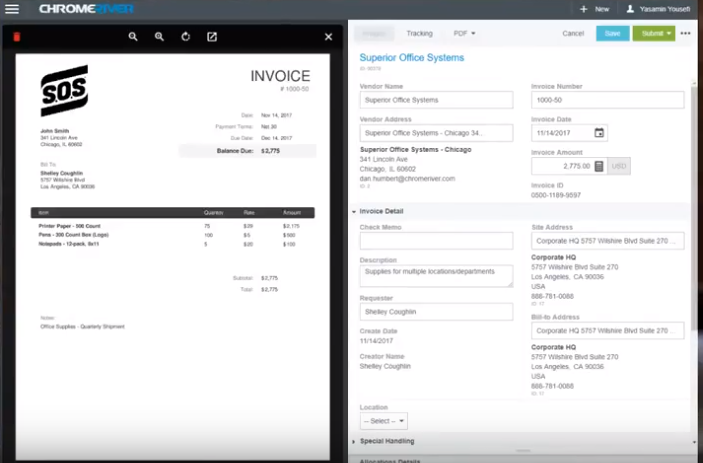 Chrome River has updated its Invoice solution to be fully mobile. Leveraging HTML5 responsive web design, users can access Chrome River INVOICE via web browser without having to install a mobile app. The same URL bookmark can be opened on any device and the website responds accordingly for desktop monitors, tablets and mobile phones. Some people prefer mobile apps over browser based solutions but there are important advantages of an HTML5 based solution. HTML5 users generally have full functionality while mobile apps typically provide only a subset of desktop features. Feature parity via HTML5 continues as the desktop solution matures because they share the same code and user access. The one downside of HTML5 is its need to for internet access. This is why most travel solutions are app based – airplanes, trains, taxi and even some hotel rooms make internet access difficult. But this probably isn’t too big of an issue for people processing invoices.